For my 5-year-old, being a non-reader is one of his biggest frustrations (following when I tell him to get off video games). He feels left out because the rest of us can read and he cannot. I like to leave little notes lying around with words that he can read . (Cat, t-rex, his name, his brothers names, you, etc). He loves it and it actually motivates him to learn to read. He also loves books that are just for him with words that he can actually read. Easy reader books, like this, that present just a few simple words at a time are exactly what he needs right now. 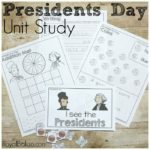 This is day 5 of the 31 Days of Printables! With the holidays coming up, I knew he’d enjoy a book for Halloween! Combine that with some vowel team practice, I knew I’d have a winner! 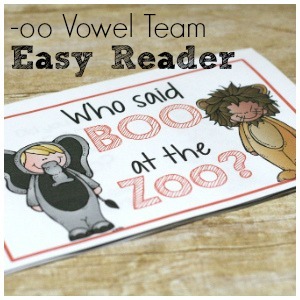 A vowel team easy reader would be perfect for both him and Royal, even though they’re on completely different reading levels. There are a lot of ways to make the -oo sound in boo, but I wanted to keep with the same vowel team. So that left four words – boo, zoo, goo, and too. We’re treating the words as sight word (for Logi-Bear at least. I’m using this for Royal too for vowel team practice). But I’m also trying to illustrate that when you see words spelled similarly, they often make the same sound. 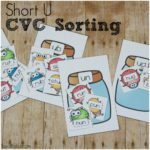 While this isn’t necessarily true for vowel teams, we’re going in to CVC words where it words out better. When he gets back to vowel teams, it’ll be easy to explain that sometimes it makes a different sound. Each page features a child dressed up as a zoo animal. They’re asked if they said BOO at the zoo? And then they reply with a sound that animal might make. I tried to make them a bit funny. It’s meant to be silly! The 2nd to last page, the child admits to saying boo and asks the last person if they said boo too? They say no, but they stepped in goo. Again, meant to be silly! I made two extra pages to go with the easy reader that focus on that -oo vowel team. I made these more for Royal (7) than Logi-Bear (5). Royal is actually learning vowel teams and sounds like that, so the extra practice makes sense for him. 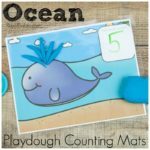 We are only 5 days into the 31 Days of Printables in October! 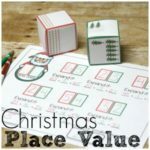 That’s 26 more days of amazing printables. Sign up for the newsletter just for the 31 days for a weekly reminder of what printables came out!